Not how you teach it. The shooting issues for Markelle Fultz have been well-documented over the last two seasons, after the Philadelphia 76ers selected the Washington product with the first overall pick in the 2017 NBA Draft. 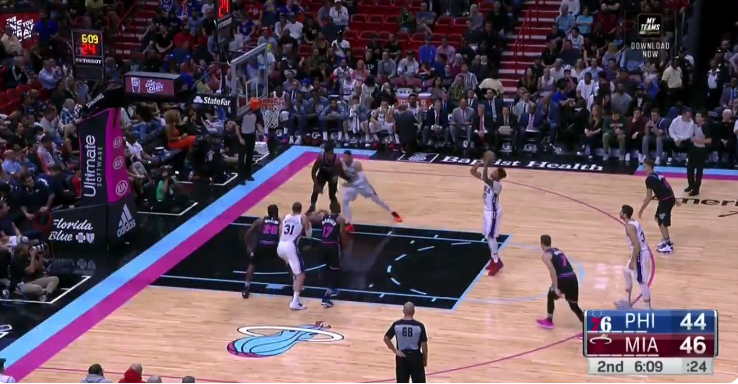 It’s seemed that Fultz is making at least a little bit of progress so far in the 2018-19 campaign, but a free throw attempt from Monday night’s 76ers game against the Miami Heat would say otherwise. This hitch in Fultz’s shooting form is, uh, not good. That certainly looks a bit yips-ish. Fultz went 1-of-3 at the line and didn’t attempt a three-pointer for the seventh straight game. But, Philadelphia (9-6) was still able to win 124-114, and they’ll get some more offensive help with Jimmy Butler likely to make his 76ers debut on Wednesday against the Orlando Magic.